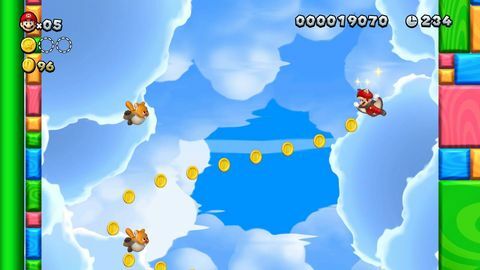 Can a 2D Mario game still impress in a post Odyssey world? Until 1985, if you can imagine such a thing, Super Mario Bros. didn’t exist. Oh sure, we had Mario Bros (the arcade game), but it wasn’t anything super. Since then, we’ve had a lot of Super Mario Bros. - 26 of them - so the chances of you coming in here with no knowledge of the franchise are, well, pretty slim. everything has so much more character as a result of all those extra pixels. The game, at its core, hasn’t changed much. You control a character (typically the titular Mario) and must run around, dodging - or squishing - bad guys, collecting coins, and - ultimately - rescuing the poor damsel in distress - as if it were still 1985. This is primarily accomplished by running and jumping from the start of each level to the flagpole that signals the end of it, ideally without dying in between times. These days, of course, the graphics are much nicer than they were thirty-four years ago, the enemies and levels are more diverse, and everything has so much more character as a result of all those extra pixels. 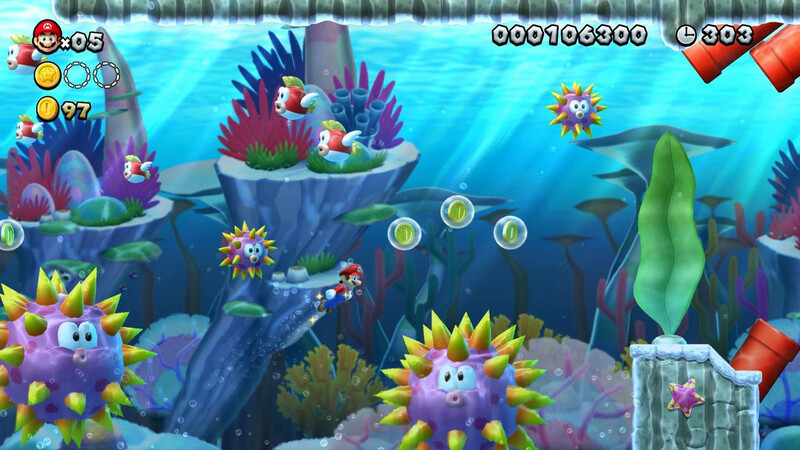 New Super Mario Bros. U Deluxe is one of the 2D variants of the basic formula, eschewing that fancy Z-dimension for some good old-fashioned side-scrolling malarkey. 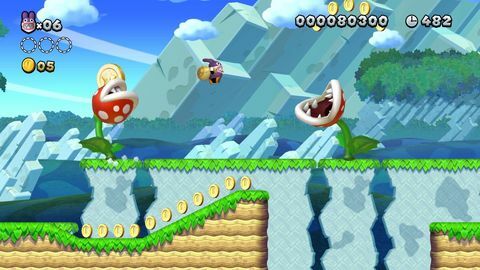 The first time around (U Deluxe is a re-release of New Super Mario Bros. U on Wii U + extras), this earned the game some criticism, following as it did the wonderful Super Mario 3D Land on 3DS, which managed to get a little depth into its largely 2D gameplay - and to great success. This time around, there’s likely to be a similar voice of dissent, as you just can’t please everyone all of the time. It turns out, however, what Nintendo can do is please me… But let's not get ahead of ourselves. 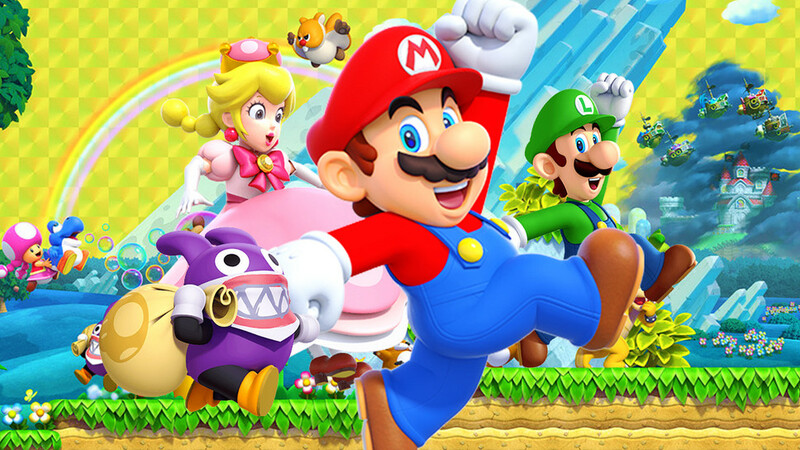 In addition to the base NSMBU game, U Deluxe adds the New Super Luigi U expansion pack into the base game and even lets you play the Mario version of the levels as the character Nabbit, who was previously exclusive to the expansion. This, combined with bonus modes that let you compete (with or without friends) for high scores of various kinds, means you get a lot of stuff to do should you find yourself trapped on, for example, a plane - as I did during the course of this review. The difficulty curve is reasonable, but it definitely does get difficult. The level of difficulty is further ramped up by adding in extra players (the game supports up to four), thanks largely to people accidentally (?) jumping on each other, but the hilarity and chaos that is also added by these shenanigans more than makes up for it. Control - arguably the genius that turned one game into a 300+ million-selling mega-franchise - is just as tight here as it has ever been, and failure is always your fault - not some shortcoming of the super-tight game design. Once you’ve finished the main game (I recommend playing through them in order), switching over to the Luigi levels mixes things up a bit by making your character slide around a bit more, adding just enough of a tweak to make things interesting all over again. 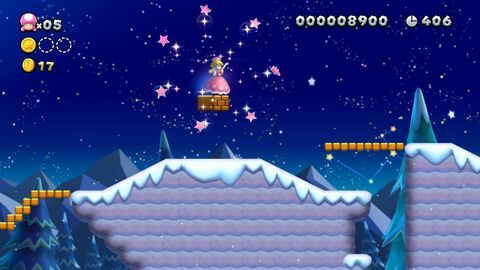 The levels in the “expansion” are different, too, a conceit that is frequently leveraged by the game’s designers to keep you guessing - especially when reaching for those hidden bonus coins. My favorite feature - unchanged from the original - is the sheer amount of character the game itself exudes from every component. From the cheery soundtrack to the way in which enemies and even the environment dance along to the tunes, NSMBUD (?!) just oozes personality. So many graphical touches, animations, reactions, and various other design elements - from the micro to the macro - combine to delight, from the first level to the last (the 164th, if you’re interested). 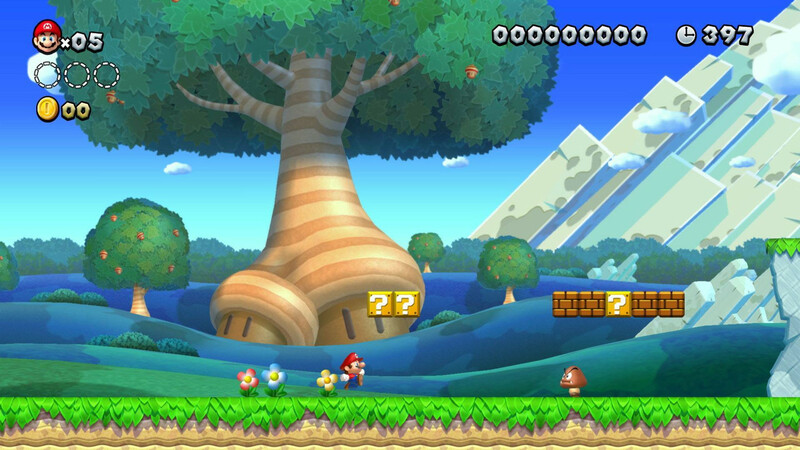 First time around, New Super Mario Bros. U was a delight. The second time around, it’s better; packing in Luigi, letting me explore the original as Nabbit, and allowing me to take the whole thing with me on the train, well… 2D Mario is going to have to do something pretty spectacular to get better than this. New Super Mario Bros. U Deluxe is a perfect addition to the Switch's ever-=growing library of excellent games. A huge amount of content, coupled with perfectly executed tight controls makes this entry a must play for any and all fans of the genre. Ups Huge amount of content. Ultra-tight controls. Lots of variety. Always fun - even when it’s hard. Downs Eventually, it will end.